The Bible calls us to share Jesus all over the world. Support a missionary. Gigie serves as our hands and feet in the Philippines and Asia/Pacific region. We support several preachers at this preaching school. We support the church of Christ orphanages in China. Every year, we put our spare change in cans and send the money off to Honduras. We support the Batam Bible College in Indonesia. We are providing support for a preachers school called Welfare of Innocent Neglected Guardian Society (W.I.N.G.S.). The Unnamed Missionary founded it in 1998 and registered under societies of India registration Act. The Unnamed Missionary, a man of vision who has a heart to serve His people, uses W.I.N.G.S. to uplift the poor and relieve sufferings through the fulfilling of the basic needs in order to bring hope to all people. W.I.N.G.S. is under the over sight of Faithful men in the K.P. 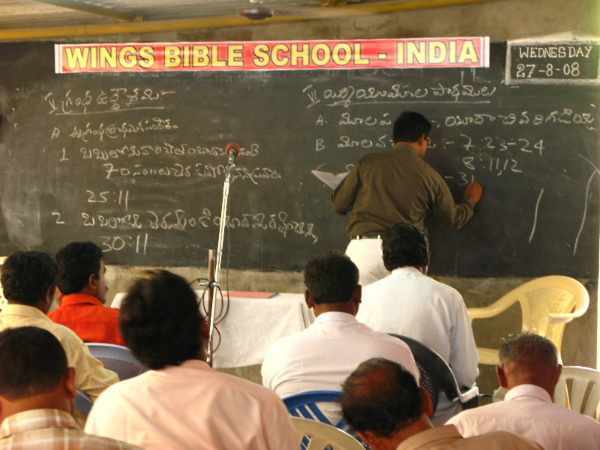 Bus-stand CHURCH OF CHRIST, Ongole, Andhra Pradesh, India. Former preacher at the Grace Chapel church of Christ in Cummings, Georgia, decided to join the work in India. After the devasting 2004 Tsunami in India, God began to direct Kurt’s heart toward India after over 250,000 people died in India. In a desire to provide some relief, the Grace Chapel Church developed a relationship with the Ongole Church and an Indian family. After several visits to India, the Unnamed Missionary began sharing the India ministry opportunities. Listen to the Bible class online or download the Bible Class file for your mobile device. Visit www.indiamissionsforchrist.org for more info. We have offered some support to Ron Brown as a church, and many individuals offer monthly support for Chinese orphan children under the care of the China Mission. In addition, several members have visited the orphanages and volunteered in medical missions and building construction. You can support an orphan for $35 per month. In addition to providing some financial support, our church has sent groups to Honduras to provide strong hands for the past two years. We also support this work with change cans amounting to around $600 each year. The Batam Bible College in Indonesia provides Christian education for men who will serve their communities as preachers and educators. Winston Bolt has visited the Waynesboro Church several times, and we provide occasional support for his mission. Listen to Winston Bolt as he instructs our Sunday morning Bible Class.